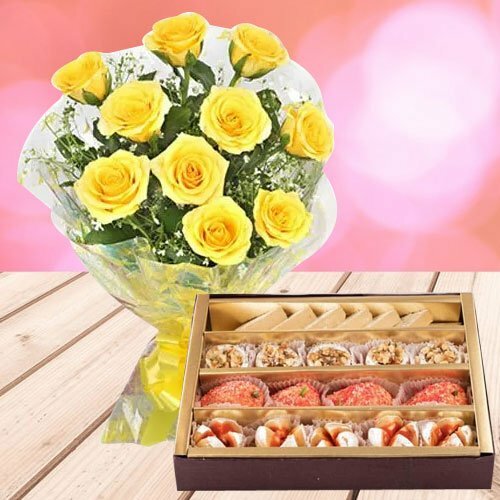 12 Pcs Yellow Roses Bouquet with Assorted Sweets 500 Gms. from Top Local Sweets Shop in the City. Flowers Delivery Belgaum, Send sweets Jalandhar, Wedding Cake Bhopal, Diwali Mithai Bilaspur, Send Flowers and Gifts to Bikaner, Online Shop Hazira, Flower to Trichur, New Year Flowers Pondicherry , Fresh Fruits Sonepat, Send Gift Guwahati, Dry Fruits to Chandigarh, Birthday Delivery Madanapalle, Sending to Bikaner, Flower shop Hanumangarh, Dharward Online Cake Delivery.